One of the oldest HP Deskjet models, the HP Deskjet 400 is a small, relatively portable printer capable of basic colour printing functions. It leaves a small footprint, measuring only 13.8x6.9x6.4 inches, and is built for light home use only. Being an outdated model, the HP Deskjet 400 may not be a practical choice even for households, unless the user does not mind waiting for slow prints to finish at a rate of 3 ppm, even in draft mode. 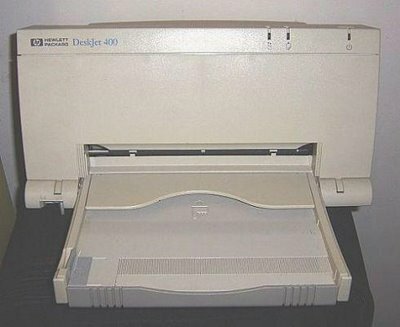 The HP Deskjet 400 printer is an old box-type model, weighing quite a lot for its size, at 6.6 pounds. It can print on various types and sizes of paper, and is compatible with basic operating systems from Windows. The HP Deskjet 400 inkjet printer makes use of 2 ink cartridges, one for black and another for tri-colour ink. Size is definitely an advantage for the compact HP Deskjet 400 colour inkjet printer. A better paper feed mechanism would have prevented constant breakdowns and paper jams. Ink costs can be kept at a minimum when using high-capacity tanks. In addition to flimsy paper trays, the HP Deskjet 400 is also inferior to other inkjets when it comes to print resolutions, since the device can only produce a maximum resolution of 600x300 dpi for black prints, and up to 300x300 dpi in colour. Users with heavy print needs are better off with a more updated model, especially since the Deskjet 400 can only print at an average speed of 3 ppm.